Eliot Spitzer announced he was involved with an alleged prostitution ring called the Emperors Club VIP (as was Britain's Duke of Westminster) and resigned. For pictures of the girls (who cost up to $31,000 a day, and are also priced in Euros and Pounds) scroll down. An international call girl ring that solicited wealthy male clients via a web site that rated its hookers on a scale of diamonds (and charged accordingly) has been busted by federal agents. The operators of the New York-based Emperors Club were named in a felony complaint unsealed today in U.S. District Court in Manhattan. The New York Times wrote about the bust. Federal authorities arrested four people Thursday on charges of running an online prostitution ring that serviced clients in New York, Paris and other cities and took in more than $1 million in profits over four years. The ring, known as the Emperor's Club V.I.P., had 50 prostitutes available for appointments in New York, Washington, Miami, London and Paris, according to a complaint unsealed on Thursday in Federal District Court in Manhattan. The appointments, made by telephone or through an online booking service, cost $1,000 to $5,500 [scroll down for fee page] an hour and could be paid for with cash, credit card, wire transfers or money orders, the complaint said. 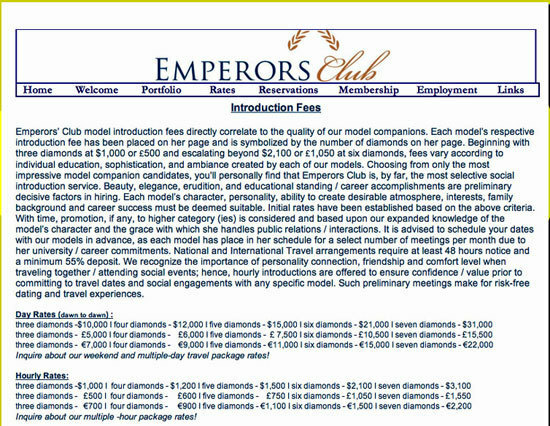 Several phone numbers associated with Emperors Club have been under surveillance by the FBI, which intercepted more than 5,000 telephone calls and text messages during the investigation, according to court documents. Excerpts of those intercepted calls, provided in court documents, offer a window onto some of the managerial challenges that confronted the four defendants who allegedly managed the operation. In them, the managers discuss how some of the Emperor Club prostitutes had difficulty taking imprints of their clients' American Express cards, making it difficult to charge them. Prostitutes weren't always punctual in arriving at their engagements. There were scheduling conflicts to resolve caused by the photo shoots of the women who modeled during the day. And clients called in wanting to know what they should tell their accountants about the expenses they were racking up with the Emperors Club. More screengrabs here at Wonkette, and links, plus see the Kristen conversation NYMag.com highlighted last week.